Early on Saturday morning, I climbed into the minivan, found the last seat, and introduced myself to the seven women and one man filling the cramped interior. Buenos dias! Wont it be fun to see another state, archeological ruins, a lake? All of us on the tour to Michoacan were language students at the Academia and had little opportunity to get out of San Miguel de Allende. But we really didnt know each other, besides seeing each other in classes. Arent you in the Modern Indigenous Peoples class with Sergio? I leaned across my seatmate to ask a hulking man in shorts squashed up against the window of the van. My name is Cherie, or Cherry in Spanish. I didnt get yours? I stuck out my hand. Im on vacation, was the rude and gruff answer, as Dr Larry continued to stare out the window at the traffic. OK, we other nine people in the van looked at each other and shrugged, some tittered uncomfortably, there were a few pointed comments about manners. Instead of hearing Jaime explain about the ruined chapels, the crumbling haciendas, the bull ranches, and the gorgeous countryside of ancient volcanoes and twisted cactus, the group (and me, Jaime too, I suppose) was sufficiently chastised and remained silent for most of the three-hour drive to Morelia, the state capital of Michoacan. Once there we visited the superb cathedral, the Museum of Masks, the candy market, the House of Handicrafts in the cloister of the Ex-Convento de San Francisco, the magnificient ancient aquaduct of 253 arches, and werent bothered by Dr. Terry as he wandered off by himself. 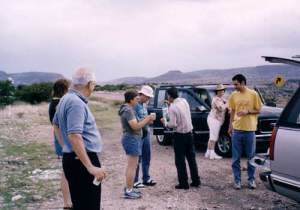 Since this trip was designed to be Spanish only and the level of skill varied with each person, it was generally only the good speakers who had anything to say. Or it would have been better that way. Sure, I was intimidated; I understood almost everything but didnt speak that well. But the three most talkative people made glaring grammatical mistakes, their bad accents were even worse, and without a teacher on board, there were no corrections and no one to slow them down. The only Mexican and fluent Spanish speaker was Jaime, who had been ordered not to talk while driving. Anyway it was enough, I thought, that he was driving and guiding us. I didnt envy him. At lunch, which was provided in a charming sidewalk café, Jaime recommended Victoria Beer, and so Judy from Seattle, sitting across from me, ordered one in between highpitched giggles that never seemed to have a cause. I had a sangria, which is half red wine and half lemonade here in Mexico. She tasted my sangria and decided shed rather have that, but when the sangria arrived, she pushed it away, asking for coffee and bottled water. When it came time to settle up for the drinks, she tossed aside her cuenta and trilled, Oh, I have no money. So guess who paid? Nevertheless this womanbrand new middleaged blond divorcee in low slung jeans revealing her belly buttonbought bubbles which she blew at men across the street, cigarettes, a museum poster. Whenever the group paused, she was found crosslegged on the ground playing with her bubbles or cigarettes and giggling her ear-piercing silly laugh. A group of teachers from Texas were traveling together on our trip. They were all proud of the permanent eyeliner they had just had tattooed a couple of days previously. 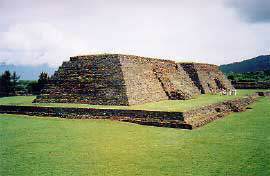 One was an eighty-year-old woman who looked sixty and could keep up with everybody, even trampling over the ruined pyramids in Tzinzuntzan. Her daughter Stephanie was over six feet tall with a deep loud voice, huge shoulders and hands, and probably used to be a man. Another of these ladies had had a terrible reaction to the tattooing and her eyes were almost swollen shut, but she maintained a cheerful good humor. She and the mother were first-class sports. One of the most militant in the group regarding the necessity to speak Spanish 100% of the time at all costs, spoke well but so quietly we were always asking, Mande? whenever she said anything. Back in the States she was a psychiatrist (who didnt insist on being addressed as Doctor, thankfully) and she looked like a nun. Mina was the most difficult to take, thoughand after all, this was a two day trip. Between passing around a photo album of her wedding and pictures of her son, she flirted like crazy with the guide. A fairly good Spanish accent, nevertheless her voice was like the scrape of a fingernail on a blackboard. The woman who was afraid for the driver to converse while he drove the roads hes driven a million times in the past, was also afraid of everything else. While not carrying these things herself, she constantly attempted to borrow sunscreen, chemical hand sterilyzer gel, tissue, a sun hat, and her conversation consisted of travelers tales of woe. Jaime almost had to take her hand to cross the street in busy Morelia. 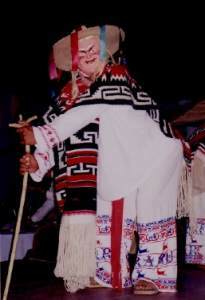 Out of all these people, Saturday night in Patzcuaro only three went to see the performance of Los Viejitos, a wildly popular and well-known indigenous dance of the Purepecha indians, in which young people, often children, wear the masks, native clothing and posture of old people. Bent over and supporting themselves on canes, they nevertheless did a lively, footstomping, humorous dance accompanied by their musicians in equally colorful outfits. Some say they are making fun of the Spaniards, but others say they dance to honor the old folks and their wisdom. But two of our little group went to Mass instead, and the rest stayed in their rooms ironically studying Spanish from their textbooks. Here was Mexican culture in full bloom all around them, with lots of correct and colorful Spanish in the air, and they were closeted with their books, each other, and their gringo accents in hotel rooms with moldy bathrooms. Go figure. The best thing about our outing besides the sites themselves, was the surprise stop on the highway on the way home. Jaime had planned a tailgate margarita party out there with the cows and a view of green fields, exotic cactus, ancient distant craggy mountains. The bubbleblower stood next to the truckers and blew bubbles at truckdrivers, the flirt did her best to monopolize Jaime as usual with personal questions, the Doctor wandered off on his own and made us all wait in the van while he took some more photos, the four teachers clustered tightly together discussing which is the best spa in San Miguel, the scared one put on more sunscreen even though it was going to rain any second, and I enjoyed my margarita. The postscript to this weekend is that once back in San Miguel, the group went to a very fine Italian restaurant as part of the tour package. It had stopped raining and we all sat on the roof enjoying the beautiful sky and a nice glass of Italian red, and I started to relax and remember the wondrous things I had seen in the past 36 hours. Suddenly from nowhere the wind whipped up and the pool of rainwater collected on the canvas roof an hour earlier swept over our table and drowned us, our wine, and our tasty Italian bread. I knew when enough was enough, and I walked home, planning in my head as I navigated the dark cobblestoned streets. I didnt know when or how I was going back to Michoacan, but I knew I would go alone.